As the First World War raged on, the government was in constant need of additional money for the war effort. The British Army first used tanks on the Western Front in September 1916 and they soon took on another role, as a fundraising tool. 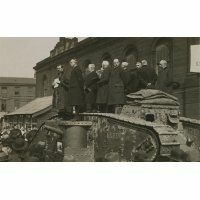 In April 1918, a different kind of campaign came to Doncaster: Tank Bank Week. 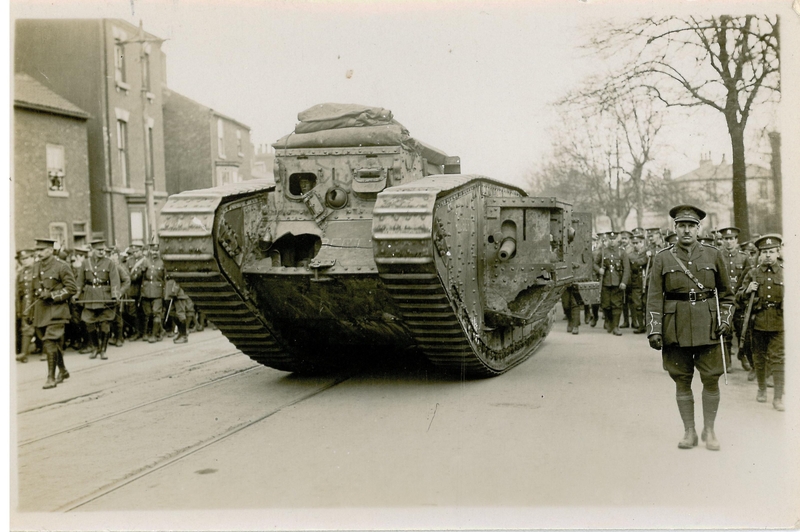 A battle-scarred tank named Egbert arrived in Doncaster in late April 1918. Egbert was one of six tanks that toured England, Scotland and Wales to fundraise for the war effort. It was a huge event and the local newspapers were filled with adverts and excited articles. Local businesses took out individual adverts in the newspapers to encourage their customers to buy war bonds and war savings certificates. 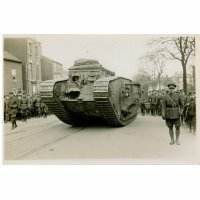 After his arrival on the weekend of 20-21 April 1918, Egbert the tank had his first outing on Sunday. After leaving the Great Northern Railway Goods Yard in St Sepulchre Gate, the tank ambled towards the Racecourse. A guard of the Doncaster battalion of the West Riding Volunteers accompanied Egbert on his journey. At the Racecourse, the tank made its way across an obstacle course including barbed wire and trenches. Mayor Carr climbed on top of the tank to declare Tank Bank Week officially open at noon Monday in the centre of the Market Place. Visitors purchased War Savings Certificates and Bonds from a temporary Post Office in the Market Place. They then went to the makeshift office set up inside the tank to have their bonds and certificates stamped. 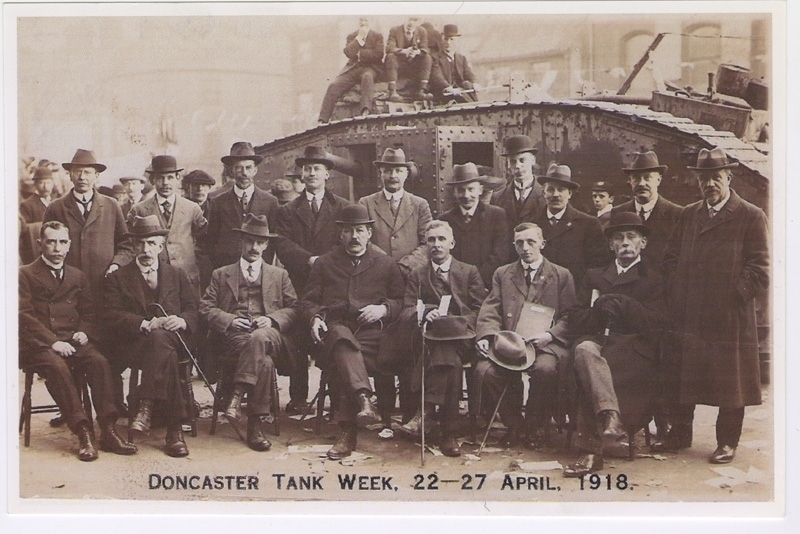 People from all over Doncaster flocked to see the tank and the total for Monday was £25,000. Business continued on Tuesday with a number of high-profile purchases including Mr Warde-Aldam, of Hooton Pagnell Hall, and local businesses including Dennis Roberts and Sons and Sheard Binnington and Co. This made the second day’s total much higher at £55,000. On Wednesday, it was the children’s turn to enjoy the excitement of the tank’s visit. Over 4,000 students from local schools including Oswin Avenue, Balby Central School, and Oxford Place Wesleyan descended on the Market Place to purchase their bonds, bringing Wednesday’s total to £40,000. More schoolchildren visited the tank on Thursday, this time from schools including Beckett Road, Chequer Road, and Hyde Park. Thursday’s total was £48,000. Friday saw large investments from businesses, with £25,000 coming in from the Brodsworth Colliery Company alone, bringing Friday’s total to £62,000. On Saturday, visitors were entertained to music by local colliery bands including Bentley and Yorkshire Main. Balby Wire Company, the Brodsworth and Yorkshire Main Colliery Companies and the Bullcroft Colliery Company made huge donations on the final day, bringing the total for Saturday to a massive £178,000. Mayor Carr again climbed aboard the tank to bring the week to a close. The total for Tank Bank Week was around £410,000. Adding this to previous fundraising efforts by the town, brought Doncaster’s contribution to the war effort to over £2,000,000. The towns that hosted the tanks were all in competition to raise the largest amount at their Tank Bank Week. 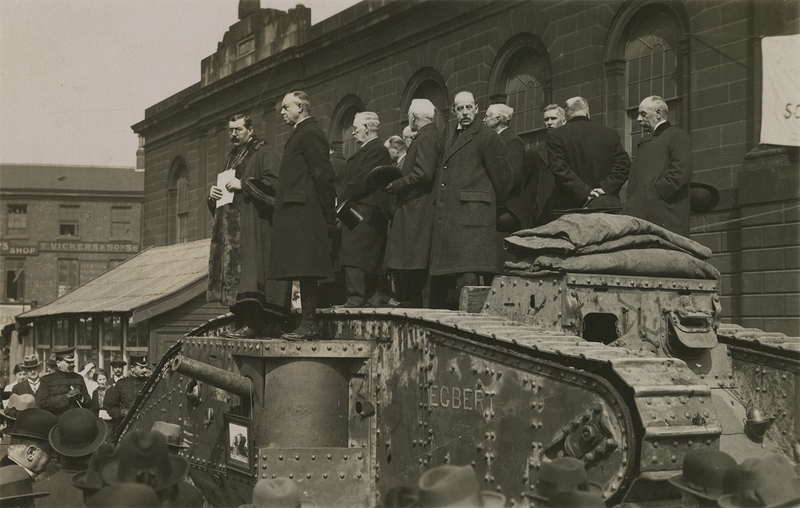 West Hartlepool raised over £2,000,000 and were awarded Egbert the tank to keep in June 1919. It remained on display until it was scrapped in the late 1930s. 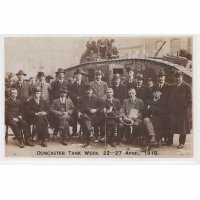 The Doncaster 1914-18 project is recreating the excitement of Tank Bank Week with an action-packed family friendly event on Saturday 9 June 2018, 10am – 3pm in Doncaster Market Place. Visit Frank The Tank, get hands-on with First World War history, dress up in war time costume, have a chat with soldiers and a fundraising woman from 100 years ago and hear live music from the First World War era. The event is completely free and family friendly.